When I first moved to Paris in 2005, I took a year off to decide what I wanted to do next. I had retired from my catering business in New York and didn’t want to spend my life behind a hot stove working 60-plus hours a week anymore. That was the beginning of the blog boom and I thought—just for fun—I would start a blog about my adventures in Paris. I had no former writing or photography experience but gave it a whirl anyway. 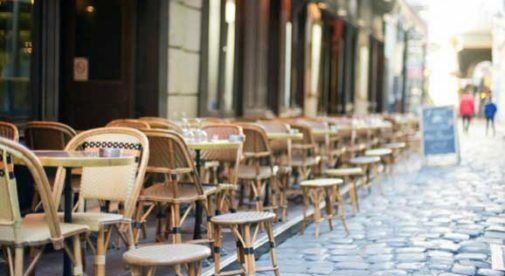 So, I would go to the latest art exhibits at the Louvre and D’Orsay museums…dine at quaint bistros…indulge in delicious cakes and pastries at top patisseries…visit unique boutiques and then write about them. In the beginning I posted twice a week about fun attractions in Paris and within the year I was getting many email subscribers and my advertisers were getting a good response…so I increased my posts to four times a week. After six months I was approached by a website and a magazine to write paid articles about Paris. Another online publication asked me to write 150-word blurbs twice a week about the latest restaurants, shops, and hotels in the city. Soon hotel and short-term rental apartment companies, travel insurance companies, and limousine services asked if they could put ads on my blog. At one point I was making $400 to $500 a month from the ads and another $600 a month from my writing assignments…just for enjoying the delights Paris has to offer. I take all my own photos for my blog and last November a major European fashion magazine asked to use an image from a post I wrote about the Christmas windows in Paris and they paid me $150. A top New York decorator bought a print of one of my photos for $800 for a client’s Manhattan penthouse. Plus, I now charge $150 to $200 for guest posts on my blog. That’s when companies want to write an article about Paris or France with links to their companies located in the text. In recent years I’ve expanded my writing repertoire from just Paris to other cities in France and places all over Europe. Last October I went to the Algarve region in Portugal, famous for its gorgeous beaches, and stayed in two luxury hotels for a drastically reduced rate. After my trip, two magazines accepted my pitch for a story about the hotels, which made me $650, almost the cost of my entire trip. Next week I’m going to Naples for four days and I am receiving a night free at a luxury boutique hotel plus complimentary breakfast for me and my friend. Plus I scored two free City Passes for museums, tourist attractions, and transportation, an $80 value. Have to run now…I’m invited to a private tour of a famous chateau plus a complimentary lunch at a Michelin-star restaurant at a five-star hotel followed by a spa treatment.